The origins of St. John’s can be traced to the 1830’s with the coming of the Rochdale Canal in 1834 and the railway from Manchester to Bury in 1848. A number of mills built alongside the canal created considerable growth of population in the Gooden area. This was reinforced with the construction of the Manchester to Bury railway, which passed through Heywood. Around 1841, two schoolteachers from St. Luke’s set up a school in Mount Street. Thomas Ramsbotham, the incumbent at St. Luke’s in 1866, felt it was his responsibility to open up church work in this part of Heywood and he therefore arranged with the vicar of Birch for the formation of a mission district called Hopwood. Instead of enlarging the school in Mount Street, a new school was built in Rock Street in 1868, which was situated in the centre of the new mission. The Hopwood Mission was dedicated to St. John and the intention was that it should eventually become an independent Parish. The Mission proved a resounding success, with congregations, especially the Sunday schools,rivalling those of their mother church. It was agreed to build an iron church on the present site of St. John’s at a cost of £1,000 ( see picture above). However, at this time, Fenton’s, a local bank, collapsed. Although none of the Church Building Fund had been deposited with bank, the Heywood Parishes were badly effected and the resulting depression caused the plans to be delayed. Eventually the Church was finally built in 1881. A Mr George Speight, who was a member of the congregation at the time, was the architect. Diggle Bros laid the foundations and Messrs Kent of London built the church itself. During this period in time you could buy your own seat in the church. The cost was two shillings a sitting and included a cushion, but no carpeting or hassocks. The chancel was painted sky blue and dotted with golden stars. The Rev. Waldie was the priest-in-charge. 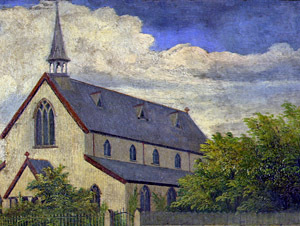 It soon became apparent that a more substantial building was called for and plans were drawn up in 1885 to build a permanent church on the same site. Colonel Hopwood who owned the land was not in favour. In his opinion it was a mistake to place any building with architectural pretensions on the site and he felt it should be built further towards what is now Coronation Avenue. Although it was an awkward piece of land containing a farm, a Dutch Barn and a shippon (a cow shed), the cost of purchasing the land was less, the location was more central and also closer to the Sunday School at Rock Street, than the other two sites suggested. With no wealthy people connected with the church it was decided to go outside the Parish to raise the necessary funds. Every clergyman in England was circularised and also Members of Parliament, lords, barons and knights. £5000 was needed, so fundraising started in earnest. Bazaars were held, which would last a week at a time and raise in excess of £1,000. The trustees appointed to purchase the land etc. were James Hardman, Richard Grundy, George Bell, William Livesey, Fred Ferrand and the Curate-in-Charge, Rev. Emery. A Mr Pilling, solicitor at Heywood Town Hall, agreed to do the conveyancing and saw it through to completion, despite moving to Davenport in Devon as Town Clerk in 1896. Relations with Colonel Hopwood and his agent were fraught. One obstacle after another was created by his agent, Mr Batey, regarding the purchase of the land and the cost of re-siting the shippon. The frustrated vicar, Rev. Emery called it a blankety-blank nuisance. It took from 1892 when a decision to build the church was made, to December 1899 when St. John’s actually became freeholders of the site. The iron church was fast deteriorating. Cracks began to appear between the iron plates and in 1894 a storm blew off the bell turret. It wasn’t replaced because of the cost. The architect chosen to build St. John’s was a Mr Oakley who had recently completed All Souls church. The builders were a Messrs Blakeley and Wild of Gregge Street, Hopwood. Their estimate was £3,961 and it was necessary to borrow £2,000 from the Church Building Society. The church bell is 16” in diameter and was cast by J Warner & Sons, London in 1881. The bell was transferred from the iron church. It is situated in the Tower, but for safety reasons, it is no longer in use . The nave is covered by an open timber roof, with spare being boarded on top. The pews and choir stalls are of pitch pine. The architect suggested red tiles for the roof to add some colour, but slates were chosen, as they were considered more durable. Stone arcades were also preferred to red brick, as was parquet flooring to boards. The organ is a Thorold and Smith built in 1887 and was purchased for the Church by James Diggle from Robert Wood who had owned Birch Mill before moving to London. The foundation stone was laid in 1903 by Mrs Beatrice Kemp, wife of Colonel Kemp, the local MP. She was presented with a silver trowel and an ivory mallet donated by James Lee, a jeweller in Market Place, Heywood. In a cavity under the stone is a bottle containing coins, copies of local newspapers and other records. 4,000 people attended the ceremony. There were buntings and flags plus a procession involving all the local churches from Church Street headed by the Heywood Old Band. Refreshments were laid on by Smith Brothers and entertainments for the children on what is now Coronation Avenue playing fields. The adults retired to the Rock Street School. The Rev. Cleworth was the first vicar of the new church and one of the first to be married here. Fine weather resulted in good progress being made and by September 1904 the structure was complete. The small tower intended to have a spire, but this had to be omitted because of lack of funds. The Church bell was therefore hung at the east end of the church. The building was consecrated as a District Church on Wednesday 25 January 1905. The three Baptismal Windows at the rear of the Church were installed for the consecration in memory of Miss Janet Bell, a Sunday School Teacher, a tireless worker for the Church, who died in 1900. The inscription reads ‘To the Glory of God and in memory of Janet Bell. Born 1865, Died 1900’. The Choir stalls were donated in memory of Albert Ashworth Ferrand who died on the 12th January 1890 aged 2. The Lectern was presented to the Church in memory of Netta Watkinson, also a Sunday School Teacher who died in 1900 aged 27. St. John’s officially became a Parish the following June when the following notice appeared in the London Gazette, ‘ASSIGNING A CONSOLIDATED CHAPELRY TO THE CHURCH OF ST. JOHN THE EVANGELIST’. The start of the Great War in 1914 was to create great changes to lives and society. Few expected the privations and appalling loss of life that would result from the conflict. St. John’s parish suffered its fair share of losses and casualties of men cut down in their prime. The first Memorial Service for the Fallen and Thanksgiving for the Retuned was held on All Saints Day, the 2nd November. The Sunday School presented a laurel wreath. During the early Armistice Remembrance Days, a laurel wreath, an emblem of all four countries, was carried and placed on the Chancel Step. On the inside of the Tower wall, over the Wardens Pews, is our Memorial to the men resident in the Parish who died in the First World War. Along with the bronze memorial tablet, the Church Tower was erected in memory, giving a finishing touch to the West Front of the Church. On the 5 November 1919, a marble tablet was unveiled and dedicated to Charles Arthur Coupe who was killed in France on the 14 March 1917. This Tablet is situated on the North wall in the Parish Room. Also in the Parish Room is a tablet to another servant of St. John’s, Jehu Diggle, which was unveiled in his memory in January 1932. The oak screen behind the alter was erected in memory Alderman Grundy, who was one of the original trustees. 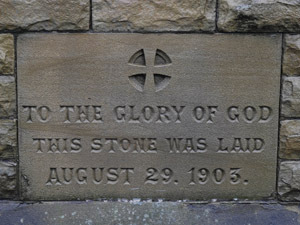 The stone pulpit was obtained in 1936 from All Saints Church in Elton, Bury. Following the end of World War 11 in 1945, the PCC agreed on a new Oak Altar and Reredos as a memorial to the Fallen. Instead of being an ornament it would be used regularly and would be a constant reminder of Jesus Christ’s Great Sacrifice for all humankind. In what is now our Parish Room, is situated St. John’s only stained glass window , ‘The Good Shepherd’ . Miss Edith Nuttall, who died in 1958 made a bequest for a stained glass window in memory of her brother Arthur, who had died 2 years earlier. In the 1970s a decision was made to partition the North Isle of the Church to form a Parish Room, with an extension at the East end to provide kitchen facilities and toilets at an estimated cost of £15,000. 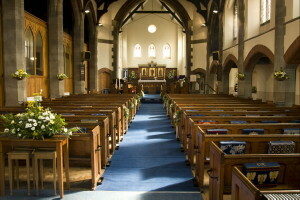 The pews in the area were dismantled and used as partitions at either end, with blue velvet curtains, to match the carpet, erected between to complete the division. After fundraising and Gift Days, work finally started on the kitchen and toilet extension in 1983. Eventually the extension was completed in 1989. The official opening took place on the 23 September by Warden, Alan Glover, with prayers from the vicar. This followed a ‘Cavalcade of Weddings’ in the afternoon. In the evening a disco and a potato pie supper were held in the Parish Room. Old pews were also used for the adjoining doors between the Parish Room and the Chancel, constructed a couple of years later by Bryan Kennedy, who, at the same time, also made and fitted the handrails to the Chancel steps. The curtain separating the Church and the Parish Room was proving unsatisfactory and it was decided to install a wood and glass partition. Redundant pews from St. Luke’s were cleaned and sanded by members of the congregation. The three glass panels were designed to match those on the South Side of the Church. Roger Sanders, Cabinet Maker, of Littleborough carried out the construction and installation. Recent innovations include the installation of a new low energy lighting system in the Church, replacing the existing, expensive and unreliable halogen lights, and, following a generous bequest, a permanent disabled ramp along the South Side of the Church. The last 12 months have seen major work carried out to the West Wall and windows. It was with great relief that the timbers were still in sound condition after 110 years. A testament to the original builders. The specialist pointing to the external wall and tower and internal plastering should hopefully be completed by the Heritage Day in September 2015. It has been a torturous few months, with the builders going into liquidation and the resultant negotiations with the administrator bringing work to a grinding halt . All now seems to be sorted and work, which includes repairs to the Chancel windows, has recommenced. St. John’s and St. Luke’s eventually became a team ministry with the Rev. Matthew Carlisle becoming the Team Vicar. It has proved a successful and fruitful pairing over a number of years now. Sadly, Matthew moved to a new Parish in July and both churches are in what is termed an Interregnum until a new vicar is appointed. The vision, determination and faith of all those involved with St. John’s at its birth and during the generations is an inspiration for us all at the church to carry on the Christian message in Hopwood and our hope is that we do not fail them.